I really need to think up more original blog titles. I wanted to double check some details on the wood wagon I’m building, and I remembered photographing the original in Breisach,on the German/French border. The last time we went to Breisach was probably about 2012/13. This raises the question of why I can remember useless information like this for years but instantly forget important stuff like where I just put my boots. Anyway, I not only remembered this, but even managed to find the pictures on the hard drive, so there. These wagons are pretty well used. Looking at the load they were carrying and the loading methods, I can see why they look so hammered. 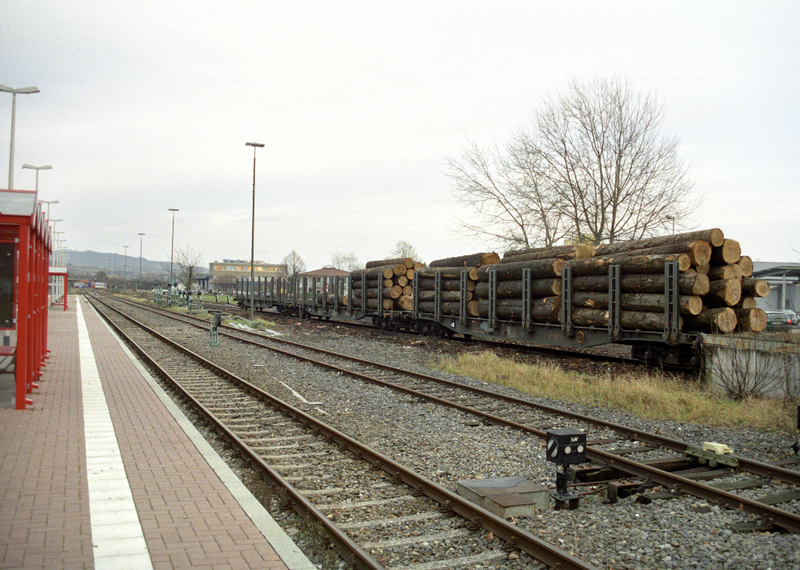 This being Germany I could wander right up to the wagons and have a good look about, I suspect they figure no-one is about to walk off with one of those logs. 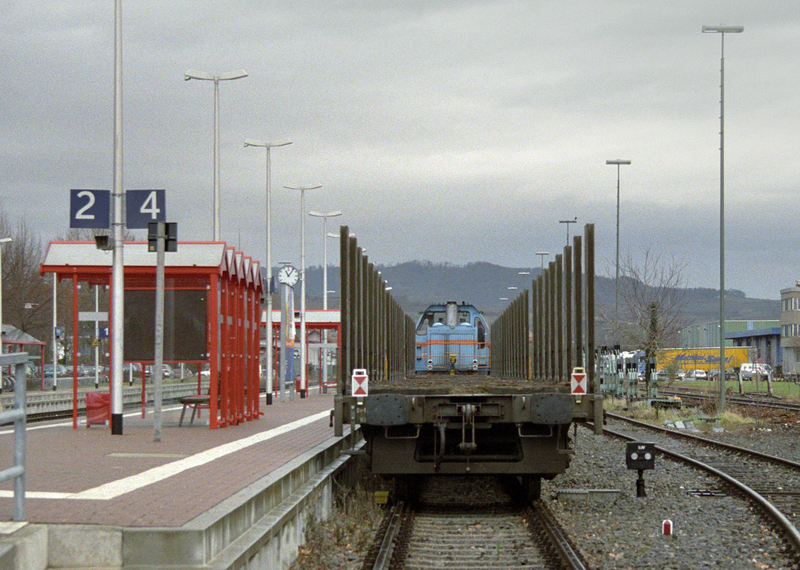 The locomotive is from the Südwest Eisenbahn Gruppe or South west railway group, who are owned by the state government. 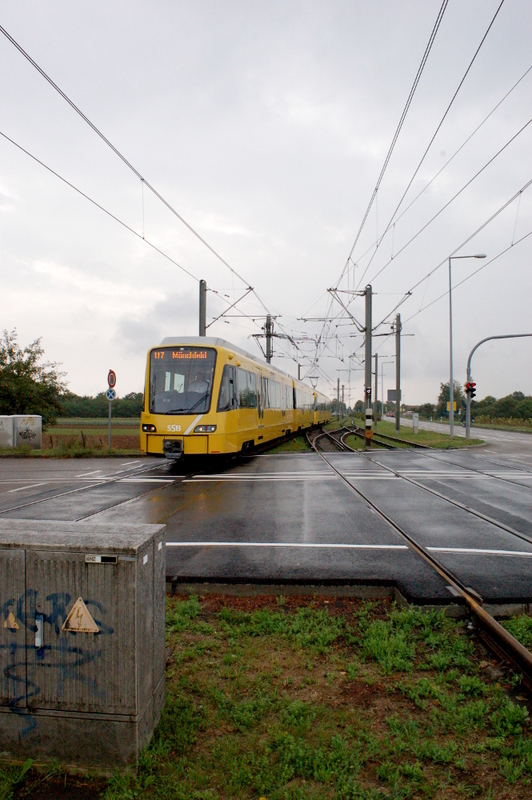 They own and/or operate a few local railways in this part of Germany, including the line from Breisach to Freiburg. 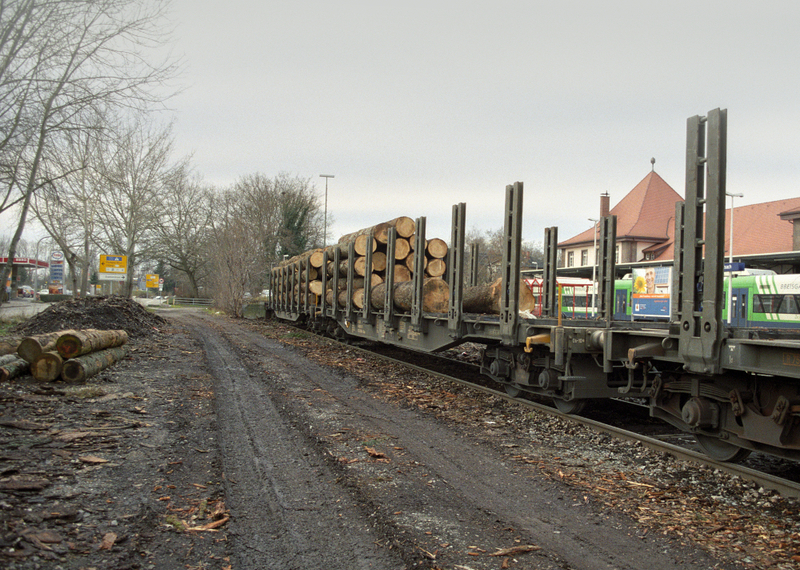 By a rather wonderful coincidence someone on the NGRM forum posted a link to the German railways wagon catalogue just as I was writing this entry, so I now know this is a type ‘Snps (typ179)’ heavy duty wagon for timber, pipes, and other thumping great big objects. They are equipped with Extra wide stanchions, and inbuilt ratchet systems with rollers in the stanchions themselves, so loads can be fastened down by one operator. 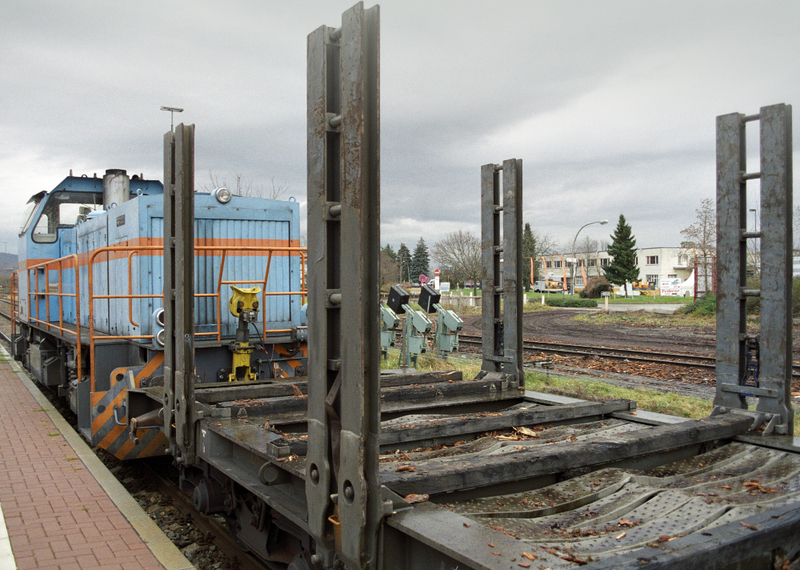 The wagons have wooden bolsters for each pair of stanchions and extra slightly lower bolsters in between so the loads doesn’t sag while being carried. Re-reading that last paragraph makes me realise why I’m rarely invited to parties. Here’s a blast from the past. The beginnings of a heavily used timber wagon found lurking at the bottom of a box. 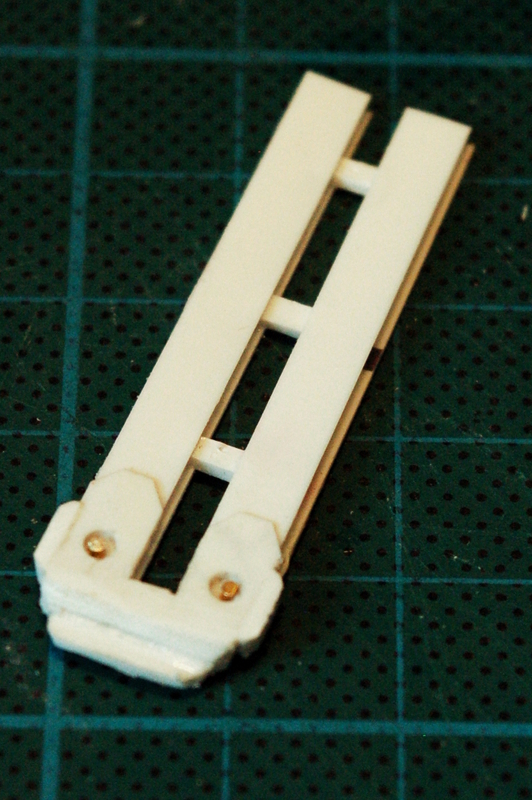 This dates from the time when I first started making models again, and planned to build my models in 1:43 scale. 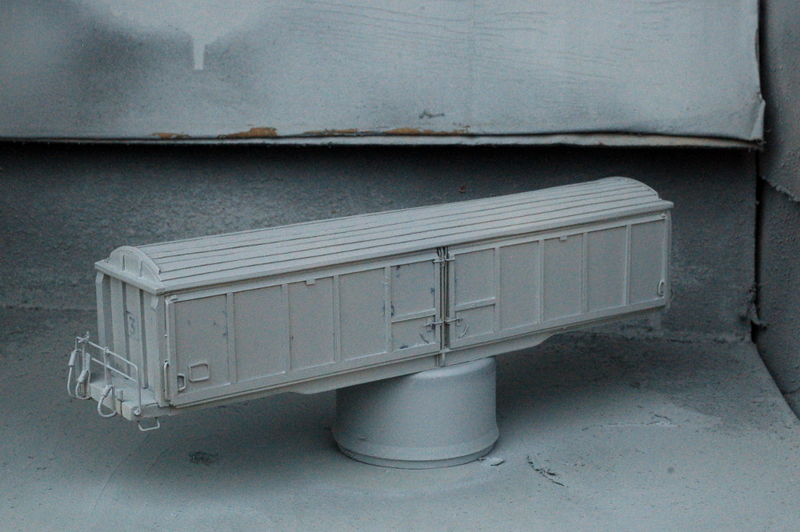 Apart from this I’d started a couple of other wagons and a railcar, and they all looked pretty awful. Partly this was a lack of experience and partly because no matter how much I tried the mahoosive models I was making just didn’t fit the tiny wheel sets available, so I changed to 1:55 scale. I remember carefully making the original out o fairly thin plastic sheet so I wouldn’t make the frame too thick. This is probably why the old model is now the shape of a banana. 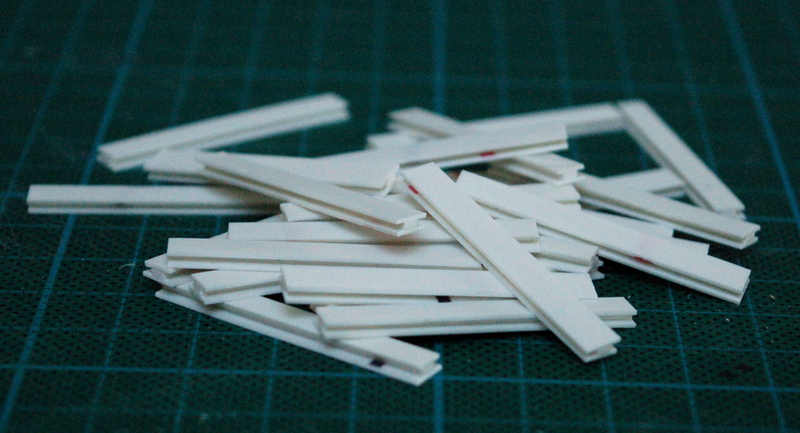 The new version is a bit more pragmatic, made of several 0.5mm thick sections glued together, partly for strength and partly because that way I could use up the offcuts of 0.5mm thick plastic I had kicking about. I’m hoping the over scale thickness will be made up for by the model lasting a bit longer. 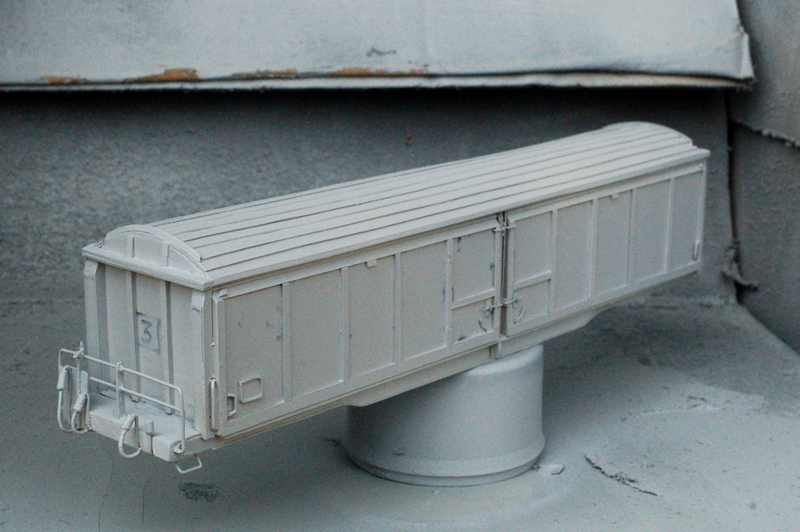 Besides, I can hide everything with weathering, right? I’ve been out and about a bit this week and therefore away from my modelling bench but still managed to work a bit on some of my more ambitious ideas. One is that the model of the Körschtalbahn will be at least partly electrified, because the one thing I need in my model making life is another layer of complication. 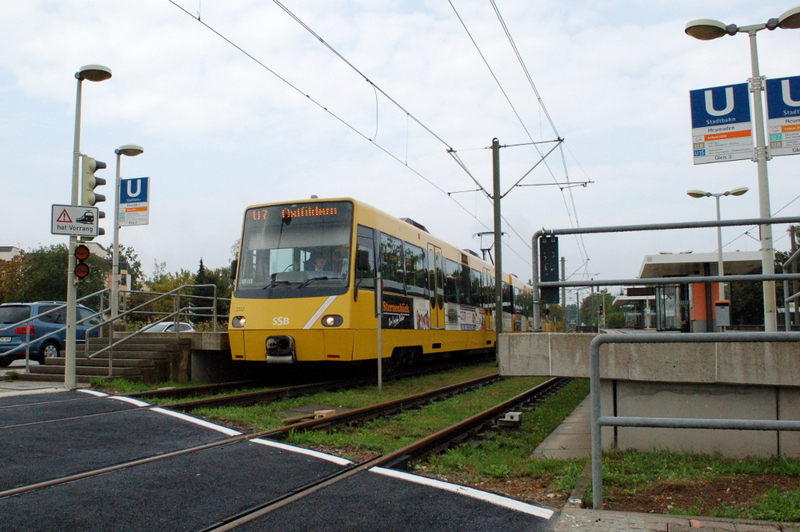 The trams in Stuttgart work using a a 750v DC system, which seems to have been pretty normal for German urban and rural tramways back in the day when AC electrification was newfangled technology requiring components as big as a house. 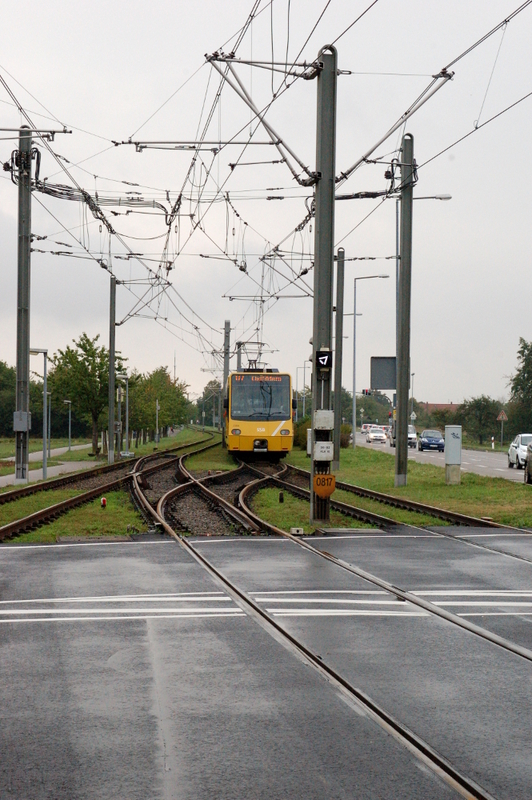 As the KÖB would probably be classified as an ‘overland tram’ this is a likely system. So far so good. That’s some serious knitting right there. Those lumpy black cables are power supply to the overhead. Clever types who understand electricity have tried to explain why this and I got as far as understanding that DC systems have pretty rapid voltage drop unless you make the cables the size of drain pipes, so you need to keep boosting the power. According to my entirely unscientific survey,in this case this happens every twelve masts or so. Which is all well and good but it’ll be a bit awkward to make models of. At this point sensible people point out that really, no-one will notice if I don’t have the extra details,in fact a lot of model makers take the pragmatic approach of leaving overhead wires off their models altogether and just having uprights, pointing out that wires are obvious to us because we see them silhouetted against the sky, and from above they’re pretty invisible. Either way, I could ignore the need for the power supply. As the Körschtalbahn currently consists of a railcar, still in primer, a van and an as yet unfinished diesel, this is not going to be a decision I need to take for a while anyway.